For over more than five years, I send a special more than 1000 Miles per Watt QSL card for ”more than 1000 miles per watt” QSO's that I make. The card is designed to give all the information concerning 1000 MPW. 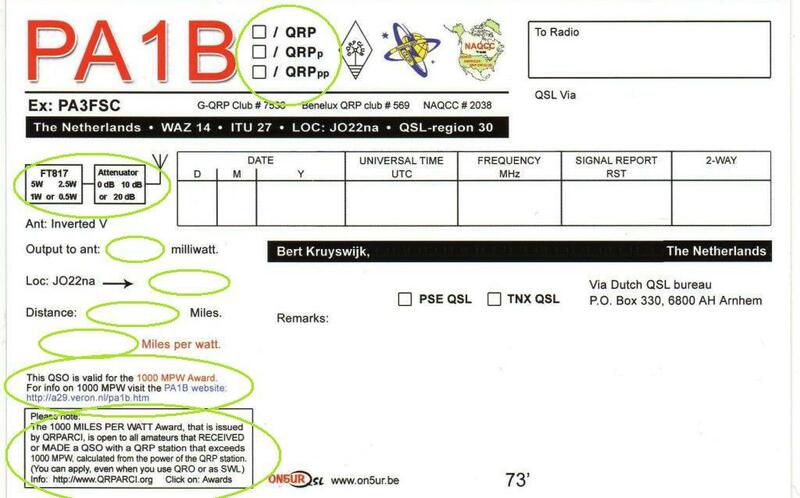 I use this card exclusively for QSO's with more then 1000 miles per watt. (Calculated from the output power of my QRP station during the QSO.) The card shown here is from the second batch of 1000 cards. The first 1000 cards are already sent. Click here or on the card to to enlarge this card. 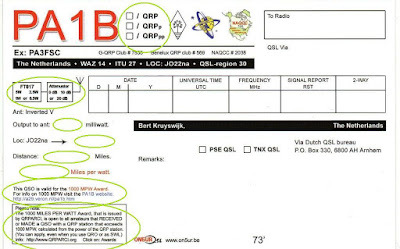 The back of the card is specially designed to inform the receiving station, how I made the QSO with very low power. In the drawing of the FT-817 and the attenuator I encircle the used power and the used attenuation. For a QSO with 50 mW, I encircle 500 mW in the FT-817 and 10 dB in the attenuator. The power to the antenna is given in milliwatts.